Damage is romantic. Our hearts go out to the broken, wounded and wrecked. The works in this evocative exhibition are not literally but only apparently damaged. The 20 artists included in Perfectly Damaged (selected by Isaac Lyles) traffic cleverly in the soulful poetry of ruination. Graham Collins finds old, thick boards and subtly alters them with spray paint, putty and dye. One, pointedly titled No one can hurt you, lies on the floor in two pieces, vaguely suggesting a fallen person. In contrast to its apparently damaged state, it sports a glossy metallic-blue finish. Some pieces involve carefully contrived illusions of damage. 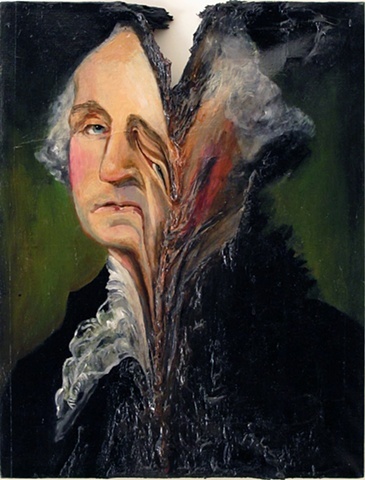 For George Washington Melted 2, Valerie Hegarty created a convincing simulation of a Gilbert Stuart-type portrait of the first president and, at the same time, made it appear as if a fire had burned through the upper edge of the canvas and turned half the subjects face into an sagging, oozy mess. Ethan Greenbaum presents a wall-hung sculptural relief that looks like a section of old, cracked sidewalk. It turns out to be a three-dimensional photographic reproduction of its subject made of vacuum-formed plastic. Michael DeLucia introduces a Platonic dimension in his pairing of a real, much dented and beat-up washing machine back to back with its spectral archetype  a simplified, undamaged version of the machine in plaster. And, in the shows most economical gesture, Jeffrey Tranchell frames a photograph of a pretty young woman clipped from a magazine. It takes a moment to discover the small, circular, white flaw in the ink, which mars the perfection like a beauty mark.